Increased economic integration, expanded mobility and advanced information technologies are planting the seeds of an emerging global culture. But what form it eventually takes will have significant implications for the relationship between citizens and nation-states. Meanwhile, artifacts from our distant past continue to be the cause of international disputes, reminding us that, despite shifting norms, the enduring boundaries created by culture continue to intrude upon international relations. Subscribers can download Kindle and PDF versions of this feature from the links on the top left of each article page. Not a subscriber? Nonsubscribers can purchase this documement for Kindle or as a PDF from Scribd, or try our subscription service for free. Globalization holds out the prospect that the world might become a single place, but the resulting integration is often perceived as increased sameness through new information technologies and the spread of consumer culture. The widening inequalities caused by economic globalization, along with the perceived ethical shallowness of consumerism as a way of life, have led to demands for alternative globalizations as well as a focus on modes of political globalization, which go beyond existing global institutions such as the United Nations and largely Western-based international nongovernmental organizations. Art and culture are two pillars on which all societies build both identity and a sense of community. But despite the common function of culture in general, the task of developing coherent cultural-heritage laws and policies is complicated by the complexities of particular nations' and cultures' interactions with one another as well as the difficulty of finding concepts that are meaningful to all in order to define the resulting legal relationships. How do we make sense of the tenacity of the idea that tourism promotes peace in light of disappointing empirical realities? 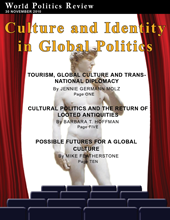 One way is to distinguish between tourism as the "globalization of culture" and tourism as a form of "global culture." By thinking about the relationship between globalization and culture through the prism of tourism, we might in turn identify areas where diplomatic initiatives could better leverage tourism to achieve some of the goals its proponents aspire to.